This stunt, which is operated by part air, part electric, includes complex mechanisms that make the mouth move in sync with a recorded digital audio loop. Although the majority of the sounds inside the attraction are managed in the main shop, this stunt is turned on daily with a switch inside box he stands on. 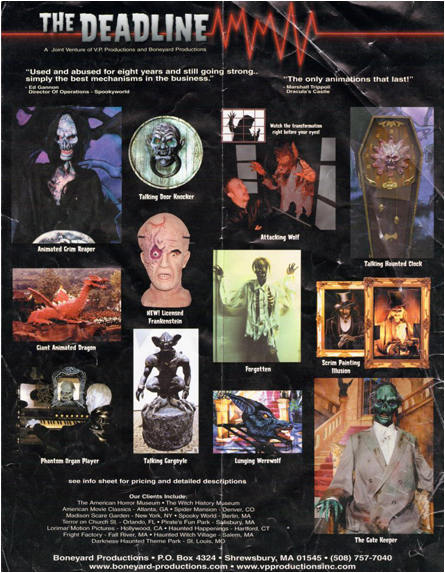 Unlike many generic animatronic sound bytes, the audio used for the count was custom developed specifically for Trimpers. In his speech, he tells visitors how they will be turned upside-down in the Upside-down room, how the will meet the now removed Frankenstein on the second story, and how they may be turned inside-out in Tracys rotating barrel. 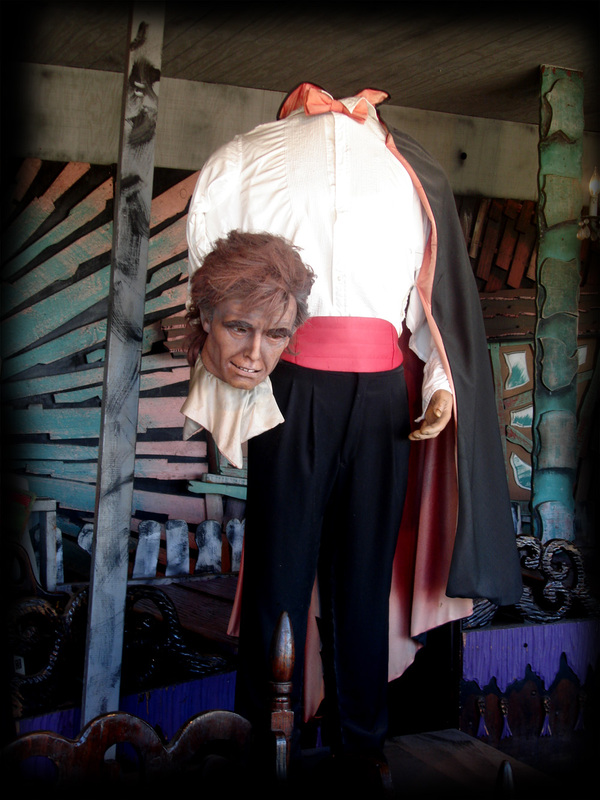 The Count has proven to be a well-built prop, as it requires very little maintenance. One of the biggest problems is the fading of the figure's clothing. The original black cape has now faded to a misty green, and the Counts pants were replaced a few years back because of fading. The original cost of the Count was in excess of $5,000, but it has surely paid off during its fifteen-year tenure in the Lobby. We have a special guest inside awaiting your arrival. His name is Frankenstein. Fear not! I will protect you! Hurry now! Gather your courage! Your coffin awaits! All aboard! Greetings, mortals. Welcome! Your coffin carriage awaits! My name is Count Wolf Von Vinderstine; and this! This magnificently horrendous mansion, is my home. My ancestors have filled this house with the scariest of tricks and traps; illusions, and realities. But don't let your mortal fears prevent you from venturing into it's depths. I will protect you from the terrors that lie within! Come; Enter the portals, of gloom house! (Laughs)"
In 2005, the Trimpers installed an animatronic talking door knocker (Gargoyle) manufactured by The Deadline, a join venture company between V.P. Productions and Boneyard Productions. The adorns the wall over the entrance door in the lobby. The inescapable and highly-recognizable screeching voice of this barker, named "The Guardian," dares you to enter the Haunted House and is complete with piercing red eyes and a pneumatically powered mouth which opens in conjunction with the narration. Although the sound track is not custom, the plaque is still a unique addition and adds a bit more liveliness to the left side of the lobby to coincide with the right side, which is happily occupied by the Count. Original ad from The Deadline featuring the famous animated talking door knocker. So hold on to your souls Kiddies! And good luck, youll need it!"